Tower Defense Evo is a tower defense game for the more thoughtful among us. Developed by Cold Stone Ltd, Unlike some tower defense games that rely on more firepower to stop the enemy, this game relies on more brainpower. The game is pretty standard tower defense fare, but the ability to create mazes separates this title from others. Each of the three battlegrounds you can choose from (with three different difficulty levels as well) are horizontal, making a great use of the iPhone's touchscreen. It's easy to zoom by double touching your thumbs, for example. To protect your "tower," you have a full arsenal of weaponry. You have a choice of several different automated swivel guns that shoot bullets, balls of energy, guided missiles, flames, electricity and lasers. You can raise more money to buy more weapons as well as upgrades buying killing enemy units. 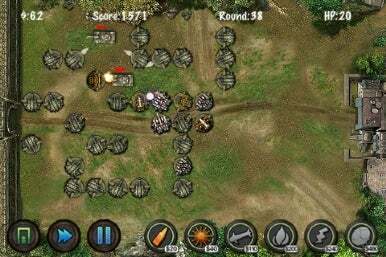 The enemy units, which include infantry, tanks and planes, make a beeline for your home base entrance on the opposite side of the screen. If they make it in, you lose one of twenty hit points. Zero hit points means the game is over. I learned very quickly that the guns could also be used as obstacles, and this is where the thoughtful part of the game comes in. Each successive wave of enemies is stronger and more difficult to defeat than the last, so you never really have time to build up a treasury. However, because the enemy units can’t destroy your guns, you can begin to create a maze-like course that slows down the attacking units long enough for your guns to take them out. The game’s designer, Color Stone Ltd. clearly has a winner here. A combination of the detailed unit design, great sound effects and a strategic game concept got me hooked. One note of warning, Tower Defense Evo really brings you in, and although there is a pause button, you’re likely to find that you missed your bus stop because you've played for so long.